So, you are thinking about finding a new furry member of the house? Ask yourself a few questions before contacting a breeder. (Trust me, most breeders will ask you these questions when you contact them.) Are you prepared to provide the environment necessary for an energetic, loving companion? 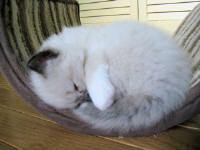 Will the kitten have run of the house, or confined when you are not at home? Do you have children or any other pets? Are you prepared to visit the cattery and see the conditions your kitten will be born and raised in? Will you understand the health and welfare of this kitten will continue to be in the breeders thoughts for the next five, ten or fifteen years? Do you feel comfortable asking any and all questions of a stranger (who won't be one long)? Ask for as much information as you want, we love to talk about our cats/kittens. We want to help you find your new furry friend. 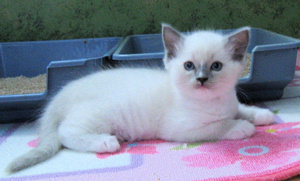 Take some time to read this article about Finding & Buying a Pedigreed Kitten. Okay, you passed the easy questions, now how about the hard one? Do you know what color or pattern you are interested in? 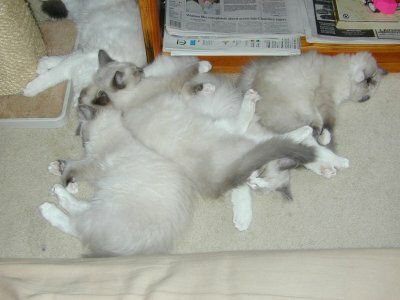 Ragdolls are available in five patterns; Bicolor, Mitted, Colorpoint, Lynx and Van. 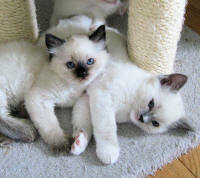 They also come in the following colors; Seal, Blue, Chocolate, Lilac, Flame, Tortie and Torbie. You might not know all these answers, but it will help your chosen breeder select the best kitten for you. The Ragdoll is a minority breed swiftly gaining interest with each year. We are a recognized breed in TICA, CFA, CCF, ACFA, and FIFE (and some more I probably don't know). 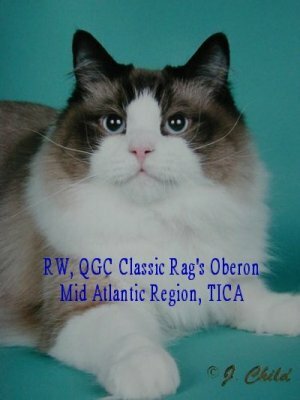 While the origins are murky, since the 1950's the Ragdoll has been recognized as a purebred, pedigreed feline. 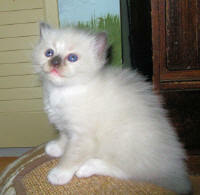 The Ragdoll is a medium, large cat, with a soft rabbit type coat. 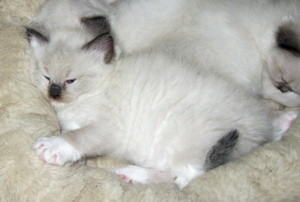 Large, slightly oval blue eyes are a trademark of this cat. While the coat is defined as medium length, without the shorter undercoat seen in most long hair cats, seasonal changes can occur. A full ruff, and full fluffy tail make an adult Ragdoll spectacular. This slowly maturing breed can take up to four years to reach it's full potential in bone growth, color and coat maturity. Matting doesn't seem to be a problem, and shedding is controlled with a meticulous grooming regime. A Ragdoll's personality is what makes it a true companion. They form a bond with the caretaker that transcends love. They will greet you at the door, sit with you while you unwind from a difficult day and just purr their delight that you are there. While typically non vocal, they can tap you lightly for attention, or drop a toy at your feet for a play session. At this time there are no recognized genetic issues in the breed. 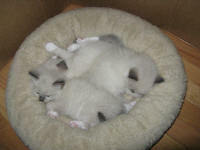 Kittens are generally released at 16 weeks of age, keeping with the October, 2006 vaccination protocol. 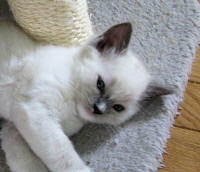 All pet quality kittens will be spayed/neutered prior to leaving my home. Three kittens shots will be administered. Rabies, blood test for FeLV/FiV, and a blood panel will be completed on the day of the surgery. I deworm twice, and test for intestinal parasites. 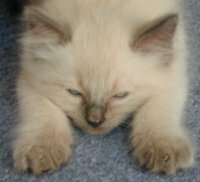 Kittens are fully weaned onto hard food (I recommend Royal Canin Kitten, and Purina One-Kitten), scratching post trained, and litter box perfect. Kittens are guaranteed to be free of genetic defects. If the kitten is diagnosed with a genetic problem, or die as the result of a genetic defect, I will replace the kitten or a refund of all money will be issued. You must have a certified necropsy performed, at your expense, for these conditions to be effective. I reserve the right to remove the kitten/cat from any environment I find negligent, abusive or cruel. I also reserve the right to first refusal if you find you cannot keep the kitten/cat. All rehomed animals from Classic Rags Cattery must have my approval prior to placement, for any reason. Contact me at classrag@erols.com for additional information!